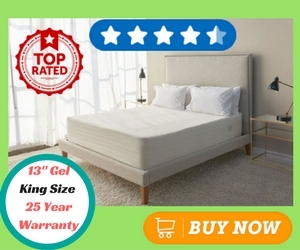 If you have been looking for a mattress that is medium firm, offering best deep compression support and excellent cooling effect then I would suggest you to try Brentwood Gel 13 inch mattress. 25 year warranty and 120 day trial period, 13 inch mattress with 3 layers and features of a luxury memory foam mattress, all at a giveaway price. This is Brentwood Home Bamboo Gel 13 inch memory foam mattress. Cooling effect from the top 3.5 inch gel layer is extraordinary. The 2 inch memory foam sandwiched between the top and bottom base layer carries air columns offering superb air flow and heat dissipation. Bottom layer is again 7.5 inch firm foam base and does not bottom out and perfectly supports average to above average built people. Made from bamboo derived rayon material and New Zealand wool, Brentwood’s cover is quite different when compared with other mattresses’ covers. While most other mattresses offer transparent covers, Brentwood home mattress employs nylon made cover for superior durability. The woollen surface offers soft cushion like feel to sleepers. It is complete white in colour with horizontal stripes across the entire surface area and is implanted with New Zealand wool. This wool is very rare, expensive and not to be found with other mattresses. It wicks moisture off the top surface, removes odor and regulates surface temperature. The zipper at the bottom of the cover makes it easily removable for cleaning purpose. 3.5 inches thickness of gel layer is relatively on the higher side when compared to thickness of gel layers included in other memory foam mattresses. This increased thickness is purely intended to provide enhanced levels of comfort, deep body countering and pressure relief. While most other mattresses with 2 to 2.5 inches top layer offer less comfort to heavily built people, Brentwood with 3.5 inches thickness offers highest levels of body alignment required for people with above average built. The cool gel beads sprinkled across the surface area absorb body heat and dissipate it downwards and away from the body thus effectively regulating body temperature. This layer has deep cavities called air columns that run vertically from top to bottom. These columns are designed to support above gel layer with enhanced air flow and heat dissipation. This base layer with 7.5 inches thickness is designed to sustain weights from top layers. Solid thickness effectively absorbs excessive weights and offers much needed motion isolation transfer feature. On a scale of 1 to 10, the firmness of this mattress can be rated at 6. It is neither too firm nor too plush. However, with 13 inches overall thickness, we can decipher that the mattress is best choice for people who are average to above average built. What firmness suits you? Mattresses that are less than 10 inches thickness are the only ones that are too plush and designed for low weight people. And with 13 inches thickness, Brentwood can easily support weights up to 400 lbs without sinking or sagging. Back Pain Relief and how to measure it? Only thumb rule to get a measure of back pain relief is that it is directly proportional to performance of both gel layer and bottom base layer. The gel layer has to perfectly align with your body curvature and the bottom solid base foam has to sustain weights from top layers without sinking any further. When these two layers perform as promised, the sleepers need not worry about waking up to sore back. Brentwood home mattress is perfect example for back pain relief. Reason being it has walked the extra mile by offering 13 inch thickness. With 3.5 inches thick gel layer that perfectly aligns at all pressure points (like neck, shoulder and hip area) and 7.5 inch thick base layer which can sustain heavy weights, Brentwood mattress is surely a proven solution to get rid of back aches. Off gassing or chemical odor in precise, is a common problem with all gel mattresses. These mattresses which are compressed and shipped immediately after their manufacturing tend to release chemical odor upon opening. However, this odor will remain for a matter of no more than 2 to 3 days. If you are looking for a quick solution, then I would suggest you to keep all doors and windows open in your bedroom and fans running for at least few hours after opening the mattress from its covers. Firstly, it is not fair to expect edge support from memory foam mattresses. Memory foam sinks deeper on the edges when compared to the centre of the mattress. And when you sit on the edges there is a problem that you might fall / slip downwards. However, in case of Brentwood, the mattress does not bottom out on the edges but it also does not provide edge support as expected. All you can be assured is that you will not slide downwards on your back when you sit on the edges. You will simply sink deep but won’t really fall down. It takes no more than 4 hours for the mattress to fully inflate to its maximum after you unpack the box and unroll the mattress. As mentioned in previous section, there is off gassing yet the smell won’t last for more than few hours if you happen to keep the doors open and fans running while the mattress inflates. Brentwood memory foam mattress comes with a 25 year warranty period and 120 day trial period. Note: As with all memory foam mattresses, shipping back memory foam mattress might cost the same amount you spend in purchasing it. In fact it is nearly impossible to ship back a fully inflated mattress owing to the weight and space it gains post inflation. Every feature offered by Brentwood bamboo mattress is on par with that of a premium mattress. More of positives and very few negatives. 13 inch mattress with 3 layers and features of a premium mattress, all at a giveaway price. This is Brentwood Home mattress.